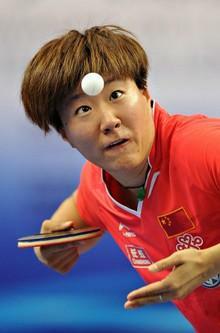 Tianwei Feng, born on the 31st of August, 1982 is a professional female table tennis player from Singapore. Tianwei Feng current ranking is World Number 6 as of April 2011. Born in China, she began training at a very young age. It was only in 2007 that she commenced her international career in table tennis. She became a Singapore citizen in 2008. Feng for the first time represented Singapore in the Olympic Games at the 2008 Summer Olympics in Beijing. On 15th August, Feng with her team mates defeated South Korea in the semifinals. The team lost to China in the Finals but they obtained the silver medal. This was the first Olympic Medal for Singapore in 48 years. It was then only that Feng won her first professional singles title in the International Table Tennis Federation (ITTF) Pro Tour Polish Open in Warsaw on 30 November 2008, in an all-Singapore final against Wang. In May 2010 the trio with Feng, Wang and Sun Beibei defeated the China team reigning at World Number 1 at the Team Table Tennis Championships in Moscow. This was for the first time that Singapore was ranked in world Number 1 as the World Champion.